The postal service in Japan is relatively inexpensive and very dependable. There are post offices all over the country, including many small towns and villages. Within Japan, the cost for a standard size letter (up to 25g) is 80 Yen, and for a postcard, 50 Yen. The Japan Post English website is full of information on available services and prices. There are a number of commercial courier companies offering convenient and efficient services. These services can deliver suitcases to and from the airport, skis and snowboards to the ski lodge, and surfboards to Okinawa and beyond, at reasonable rates. There are also special services “cool-bin” for refrigerated and frozen goods. Here are the main international companies. All of them offer services and websites in English. 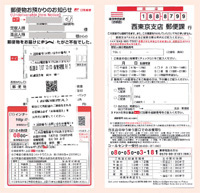 When a mail or a package that requires your signature is delivered while you are not home, a slip called “Fuzai-Tsuchi” (Undeliverable Item Notice) is left in your mailbox. When you find this slip, make a redelivery request via phone or Internet to have your item redelivered on a requested date and time. Alternatively, in the case of items delivered by Japan Post, you can go to the post office to collect the item. If you do not request redelivery or collect the item by the expiry date the item will be returned to the sender.